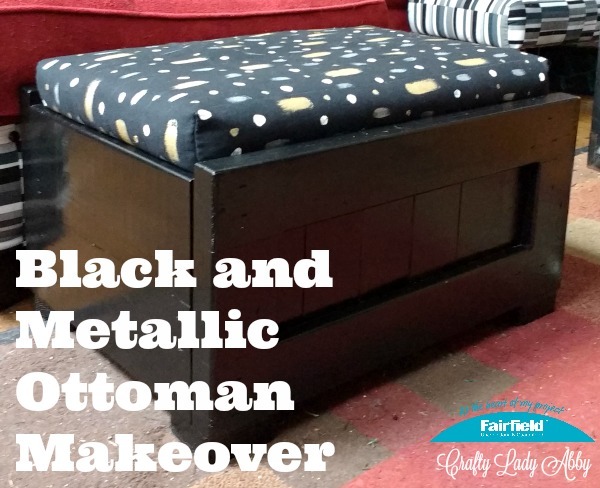 I gave an out of style ottoman a makeover with a black and metallic update. 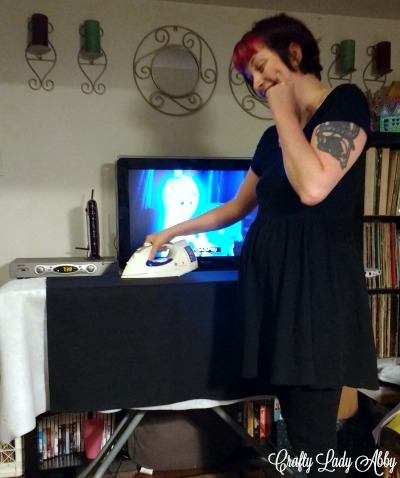 The This End Up ottoman was a relic from the 70s, that my husband and I had purchased from a friend's aunts along with some other furniture, when we moved in together 15 years ago! It's made it through the 1st years of marriage and the childhood of our now teenage daughter. The old fabric was itchy and had seen better days. The wood was still as sturdy as ever, but sporting an odd honey colored wood, which well since we have a lot of This End Up Furniture, was ubiquitous in our house. 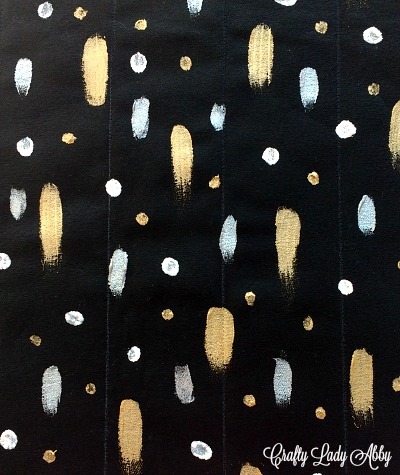 I replaced the fabric with metallic hand painted black denim, backed with Fairfield World Smooth Fusible Fleece Interfacing. 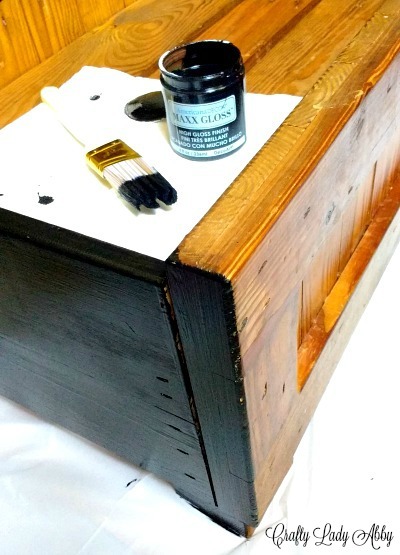 I painted the ottoman base with DecoArt Maxx Gloss Paint in Patent Leather. Feel free to adapt this tutorial to your own furniture pieces. 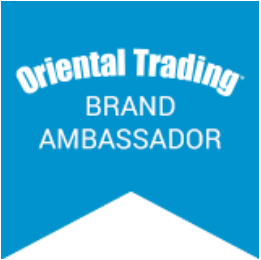 Fairfield World provided me with their product for this project. They paid me to create this project. From left to right: Gold and Black Geometric Pillow, Patchwork State Pride Pillow, Herringbone Quilted Body Pillow, Monochrome Cuddle Suede Pillow, Geometric Metallic Ombre Pillow, and Modern Canvas Ottoman Makeover. 1) Remove the cushion from the wood ottoman, and set the cushion aside. Wipe down the wood ottoman with a wet paper towel or cloth, to remove any dirt. If the ottoman is beat up, use fine grain sandpaper to smooth any roughness. Wipe away any sanding dust with another wet paper towel or cloth. Dry off the ottoman. 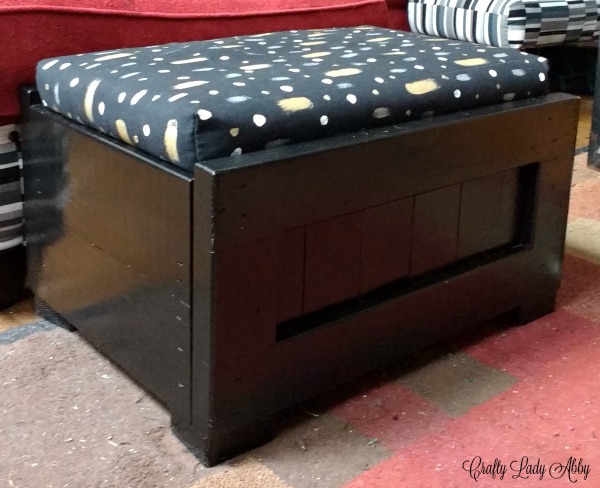 2) Place a plastic tablecloth or dropcloth under the wood ottoman. 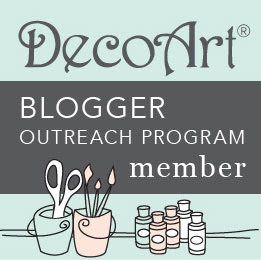 Dip the paintbrush into the DecoArt Maxx Gloss Paint in Patent Leather. 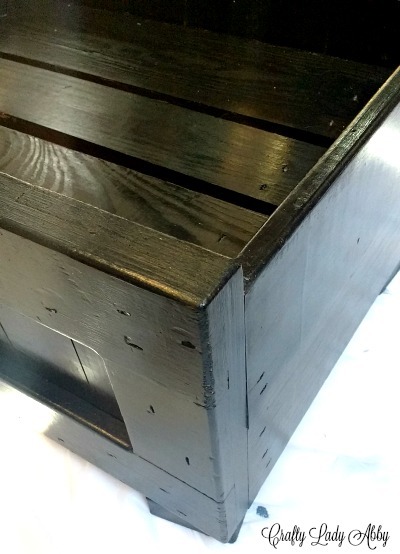 Using long strokes in the wood grain direction, paint the outside and inside of the ottoman. Use medium coats of paint. If paint is too heavy, it will cause drips. Use a small artist brush to paint cracks and crevices. Allow paint to dry fully. Give ottoman a 2nd coat of paint. This paint need 14 days to cure. Wash the brushes with soap and water. 3) Back to the cushion. Using scissors, cut off the old cover. My cushion had a horrid itchy upholstery fabric from the 70s. It was way past needing to be replaced, and I'd owned the ottoman for 15 years...sigh. My foam is in awesome condition. It just needed some smacking outside, to remove a mysterious layer of GLITTER!!! You all good and well that cushion still has glitter on it, making it fabulous inside and out. 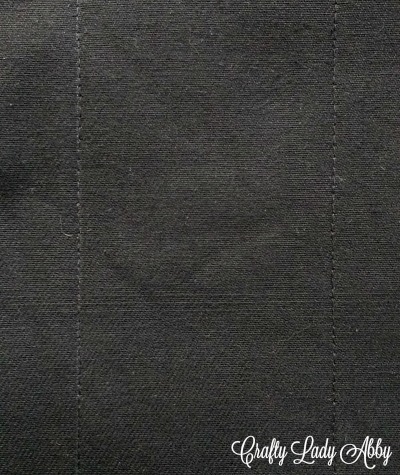 4) Lay the cushion on the black denim. Wrap the cushion in denim to see how much you will need, plus 2" overlapping seam allowance all around. The fabric should wrap around one long cushion side, to have seams around the two short and other long side. Use the white dressmakers pencil to mark the denim if needed. Cut out the rectangle amount you need. 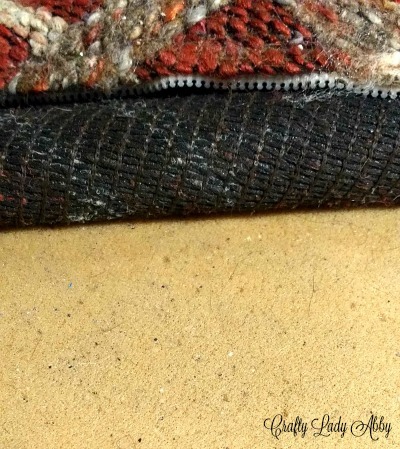 Cut a piece of Smooth Fusible Fleece Interfacing to match the denim rectangle. At the ironing board, fuse the Smooth to the denim, with the iron set at cotton. 5) Along the denim rectangle, mark lines 3" apart, parallel to the short side, with the white dressmaker's pencil. At the sewing machine, length the stitch for topstitching. Topstitch along those drawn lines. This will quilt the denim enough for the Smooth to stay in place for years. Smooth helps well smooth out the foam and give the denim more durability. 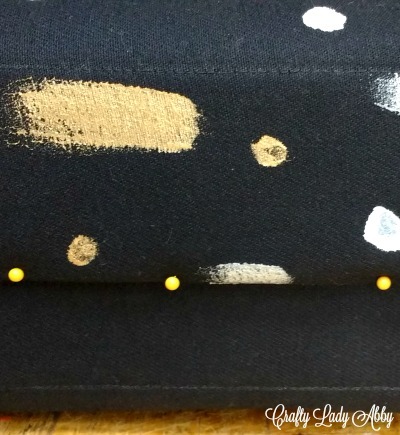 6) Using the silver, white, and gold fabric paint, with different sized artist paint brushes, paint a simple abstract design on half of the denim. There's no reason to paint the whole denim piece, since the other half will be on the cushion bottom. Let the paint dry completely. 7) Wrap the denim around the cushion, with the seams running around the middle of three sides. Pull the denim tight, securing by pushing straight pins into the denim and foam. 8) At the corners, there will be bulky layers of denim. Cut the corners, to leave 1" seam allowance. 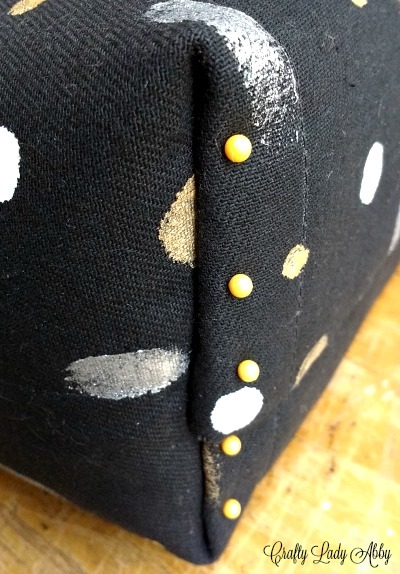 9) Fold the corners in, so the seam allowance is on the short cushion sides. Secure by pushing straight pins through the denim seam and into the foam. 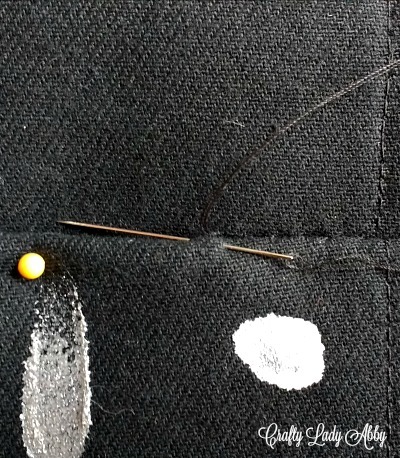 10) Thread a hand sewing needle with black thread. Match up the thread ends and double knot. 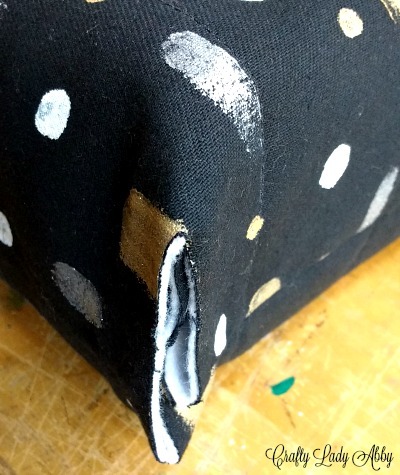 Using a blind hem/invisible seam stitch, sew the all the seams close. Remove the straight pins as you sew. To finish off a length of thread, knot the thread into the fabric. Push the needle under 2"-4" of the previous seam length, and pull up. Cut off the tail at this point. This hides and strengthens the knot better than clipping the tail at the knot. 11) Press the cushion down into the wood ottoman, with the painted denim facing up. For my ottoman, the denim seams sank below the wood edges, hiding them perfectly. If you feel like too much of the unpainted denim is showing on your ottoman, pull the covered cushion back out of the ottoman. Paint the remainder of the fabric, and place the covered cushion back into the ottoman setting, once the paint is dry. 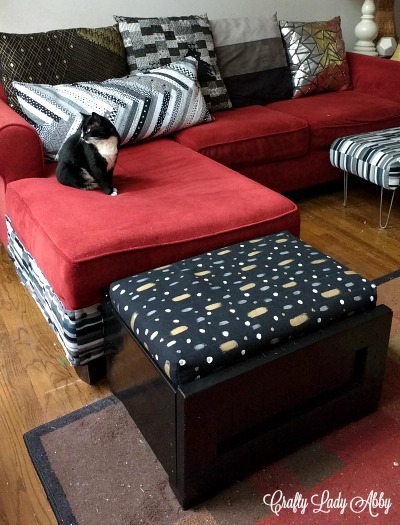 This ottoman looks amazing now, with our decor that I'm still in the process of updating. I mentioned that we have a lot of This End Up furniture, of which all of it is getting an update. You'd think these peices would be thrift store finds only, but This End Up is still in business. Actually, they still sell this ottoman, but with canvas fabric. I have the matching armchair upstairs in my sewing room, so you'll get a good look at the itchy orange fabric...yeah ORANGE...before I give that chair a much needed update. I hope you all find these furniture update tutorials helpful. Sometimes it's easier to makeover our existing furniture than replace it. Whatever you're creating, have fun with it. Happy Makery!